One of the most common things that any swimming pool owner will have to do is to shock the swimming pool. Shocking the swimming pool can be easy if you know what you’re doing or cost you a lot of wasted money if you don’t. There are many different brands of swimming pool shock these days sold by almost every type of outdoor retail center. 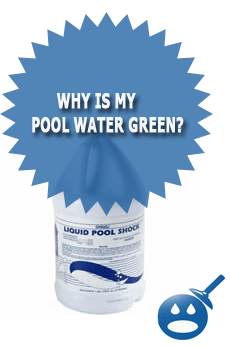 Pool Shock is an affordable way to get rid of green algae and other bacteria in your above or in-ground swimming pool. Always remember when shocking your pool that you want to keep safety first and wear eye protection when shocking your swimming pool. Sometimes pool shock can splash back at you when you’re adding it to the pool. Another thing to watch out for when shocking your swimming pool is that the back splash of the shock does not get on your shoes or clothes. Swimming pool shock is like bleach and it will stain and can eat away at your clothing. Even the smallest drop of pool shock that gets on your clothes can damage them. So if you are into DIY swimming pool repair and you want to know how to properly shock a green swimming pool, or if you just want to shock your pool to raise the total chlorine level in your pool then you will need a few things. 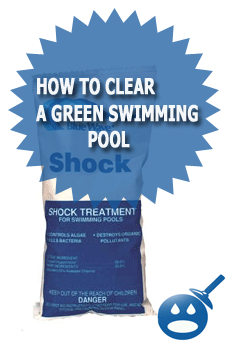 You will need either powdered swimming pool shock or the traditional liquid pool shock. You also will need a way to test the swimming pool water chemistry. You can test the water using one of three different methods. You can use a common set of test strips or a reactant dye test kit. You now can also test your pool water with a digital pool chemistry water tester as well thanks to the latest technology in the swimming pool industry. If you do not have the equipment or time to learn how to properly shock your swimming pool, you could always hire a professional swimming pool maintenance company to come to your house and maintain your pool water for you. Another alternative is that you could bring your pool water to the local swimming pool store and have them test it for you. They also can tell and sell you the correct amount of shock that you will need to add to your pool. You will have to tell them your pool size after they test your swimming pool water. There are many different ways that you can shock an in ground swimming pool. Depending on what type of filter system and swimming pool you have will determine which method is best for the in ground pool you are shocking. You can shock your in-ground swimming pool three different ways. You can shock your pool with the bucket mixing method, which is when you mix the powdered pool shock in a bucket of water. You can pour liquid shock directly into the swimming pool. The third way you can add shock to your in ground pool is to use some options on the swimming pool filter system multi-port. If the filter system on the in ground pool has a multi-port valve then you will able to add the powdered pool shock into your pool using the re-circulate option. To add the powdered pool shock this way you will first want to shut off your pool filter and turn the multi-port dial to “re-circulate” and then turn the pool filter back on again. Once the pool filter is back on again and running on “re-circ” you will want to walk over to the closet skimmer to the filter system and start to slowly pour the powder pool shock into the skimmer. Once you start slowly pouring the shock into the skimmer, the shock will go into your pump and then back out of your swimming pool return jets. You will start see what looks like white smoke coming from your pool jets or returns. After a few minutes the cloud of swimming pool shock will dilute into the water. Once all of the shock is into the pool, you can shut the filter back off and set the multi-port back onto filter again. Once you re start the swimming pool filter system you will want to run your pool for at least 24 hours for proper filtration. You off course will also want to back wash your swimming pool a few times during the 24 hours that the filter is running. 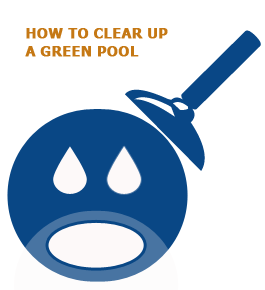 After the 24 hours is over you will want to re-check your chlorine level. Shocking an in-ground swimming pool with liquid shock is one of the easier methods when it comes to shocking pools. You can usually buy liquid shock by the case or the “car-boy” to save money. The first thing you will want to do before shocking the pool is to test the water level just like when you shock your pool using the other methods. 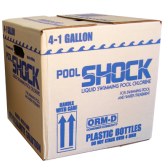 After you find out what the Chlorine P.P.M level is you will now want to look on the side of the shock container and determine how much shock you should be adding to your pool. Once you figure out how much liquid shock you will need to add the pool you will want to carry over all the require shock to the poolside. To add the liquid shock you will want to pour the shock into the pool as close as you can to the swimming pools water surface to avoid splashing. You also will want to walk around the pool as your adding it. Once you have added the liquid shock to the pool you will want to filter the swimming pool for at least 24 hours or so to make sure you get all the debris out of the water. You will also want to back wash your swimming pool during this period of time. Keep an eye on your swimming pool filter gauge as the pool filter is running, when you see the pressure rise you will want to backwash the pool. If you do not have a multi-port valve on your swimming pool filter then you will not be able to add the pool shock though the filter system using the re-circulate feature. The alternative to using the re-circulate feature is premixing the powdered swimming pool shock in a bucket of water. You will want to use a 5 gallon plastic bucket that is 3/4 full of water. The best way to mix the pool shock with the bucket of water is to pour the shock into the water. 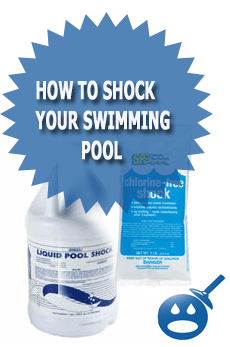 You will only want to mix a 1lb bag of pool shock with the 5-gallon bucket 3/4 full of water. If you need to add more then 1LB of pool shock then you will have to mix a bucket for each bag of pool shock. Use something other then your hands to mix the pool shock. Most people use a stick, a small metal pole etc. Once again, do not mix the pool shock with your hands. Once your pool shock is mixed into the bucket you will want to walk over to the swimming pool with the shock in the bucket. Pouring slowly and only a few inches from the swimming pool water surface start to pour the pool shock into the pool walking completely around the pool. If you are doing several Lbs of shock you will have to walk each bucket around the pool. This is the best way to spread the pool shock around in your pool. After you pour all of the swimming pool shock into the swimming pool you will want to brush the entire pool and let the filter run for at least 24 hours or more. Please also remember that you will have to backwash as well, so remember to keep an eye on the filter gauge. One of the most common questions in the swimming pool industry is “which type of pool shock is better, powdered or liquid?” There is no real right answer to that question in fact. Depending on what type of pool and filter system will depend on what type of swimming pool shock works best for you. Liquid swimming pool shock comes in a number of different ways. 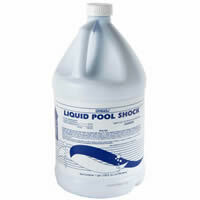 You can buy liquid swimming pool shock by the gallon at local swimming pool supply stores or even at some large home centers. Liquid pool shock also comes in something called a “car-boy”. The “car-boy container” is a plastic 5-gallon container that is usually only sold to professional swimming pool service companies. The container will require a special kind of wrench called a “car-boy” wrench to open it up. Powered swimming pool shock is usually sold by the LB. Most swimming pool supply stores will sell powered swimming pool shock in a number of different ways. The smallest amount of pool shock you can buy is the 1LB pouch. This 1LB pouch of powder swimming pool sell for anywhere between $2.99 – $7.99 depending on what brand and where you buy it. 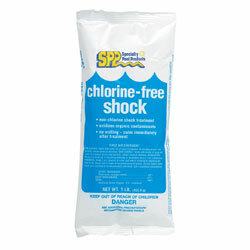 The most popular swimming pool shock is Tri-Chlorine and Hypo-Calcium pool shock. Both types of this powered pool shock are sold at local pool supply stores or by your swimming pool service professional. If you have a vinyl liner swimming pool then you will want to buy a powered swimming pool shock that will not stain your liner white if some of the shock touches the liner. Just ask your swimming pool professional to sell you “no burn” pool shock if you want to be safe and own a vinyl liner pool. Above ground pools are completely different from in ground pools in many ways. You cannot just use any old type of shock on your above ground swimming pool or you could cause damage. For instance, if you were to use a powder shock in your above ground pool and the shock was added to the pool with mixing or breaking it down first, then if that shock hits the vinyl liner it will “burn” or stain your pool liner. The best way to shock your above ground pool is to first use either chemical test strips or a pool chemical test kit. This will be the first step in determining what the chlorine level in your pool is and will help you figure out how much shock to add the pool. Once you have checked your chlorine level and have the results you will want to read the side of the package of the powder shock or the liquid shock. Different manufactures of swimming pool shock with have different strengths of chlorine in their product. So always make sure to read the side of the swimming pool shock package before adding shock to your pool. Now that you have figured out how much swimming pool shock you will need to add to your pool. If you are using powdered swimming pool shock you will want to be careful and not stain or burn the pool liner. Always pre-mix the powdered shock in a bucket or add the shock through the skimmer while the filter system is running. If you have a multi-port valve on your filter system you will want to turn it to the re-circulate position while adding the pool shock. Solution: Yes, if you do not have any shock left you can use some bleach in your swimming pool. However bleach has a lot less chlorine so it may require a lot of bleach, buy when in a pinch bleach can help. Solution: The general rule of thumb in the swimming pool industry is 1 gallon of pool shock per 10,00 gallons of water. Solution: It is always a good idea to brush the swimming pool walls, slope and floor every time you shock your swimming pool. Solution: You can buy swimming pool shock at swimming pool supply stores, places like Wal-Mart and even home centers like Home Depot and Lowes. After i put in calcium based shock in my in-ground plaster pool, the walls got stained. Does anyone know what happened and how to fix it? Lenny, fresh city water contains metals which stain the pool. As the water evaporates leaving behind these metals and more water is added, over time the metals become so concentrated that they precipitate on the pool surface in chlorinated water. The way to fix it is unbalance the ph by treating the water with ascorbic acid until the metal is resuspended in the water. But you’re not done there – the pool looks clean, but the metals are still in the water. Therefore you have to drain the metallic water about halfway or so, then refill with fresh water. That should be enough to dilute the remaining metallic water and keep them from precipitating for a while. after shocking pool three times to kill mustard algae, the chlorine measures 4 with test kit. this is after two days of shocking. Is this normal? How do you tell if pool shaock is bad. I shocked the pool with 78% Calcium Hypo which should have a ph of 11.8 & the ph level only went up to about 7.8 when it was 7.2 before the shock? How much chlonine is needed to shock a pool? I know it depends on the size of the pool. My question is how many ppm do I need to achieve? In my case I am using 12.5% liquid chlorine and have a 20,000 gallon pool. Do I keep the pool pump running while shocking the pool? @terrorhistorias no ha twitteado todavía.